Meanwhile, slice the ends off each onion then cut in half widthwise. Cut each lemon into 8 wedges. Line a roasting pan with foil*; place onion halves in the bottom of the pan. Loosen the skin on the chicken breasts. Spread about half of the Herb Butter under the skin; spread the remainder of the Herb Butter on top of the skin. Scatter the remaining lemon wedges around the chickens. Roast chickens until a meat thermometer inserted into the chicken breast reads 180F (about 75-90 minutes). If the skin is browning too quickly, cover the chickens loosely with foil. Remove pan from the oven. Transfer the chickens to a cutting board. Cover them loosely with the foil and let stand 15-20 minutes before carving. Transfer roasted lemons and onions to a serving dish and keep warm. Skim the fat from the pan juices then strain the juices into a sauce pan. Just before serving, bring the juices to a boil and season to taste with salt and pepper. 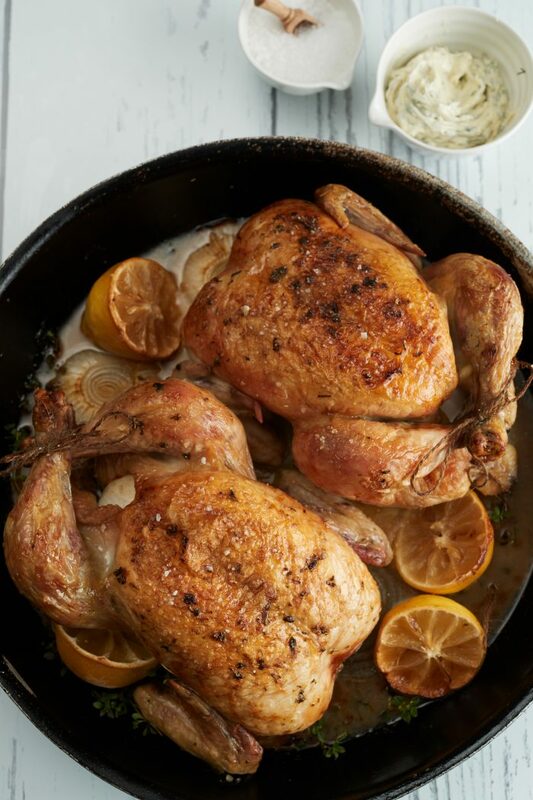 Serve carved chicken with the roasted lemons, onions, and pan juices. ∗ Or use a large cast iron skillet. Do not line skillet with foil.